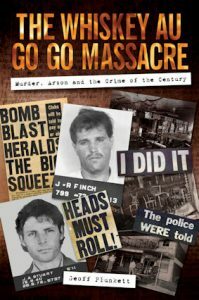 The author of the latest book on the Whiskey Au Go Go tragedy, Geoff Plunkett, gained access to heretofore sealed police files. These files reveal unsettling facts that indicate the Whiskey probe is not so much a closed case but a cold case. Here is the exclusive extract. Despite the stupidity of the act, no one should have died. The Whiskey was a death trap, a building ripe for disaster. With no sprinklers, no fire alarm, no staff training, no evacuation procedure, no fire exit sign and inadequate and cluttered fire escape doors (the sliding door was kept permanently closed), the victims stood no chance. Some newspaper reports blamed the avalanche of patrons rushing towards the exit and the ensuing panic for their fate. This shows an ignorance of fire safety research. Studies have shown that if the items listed above, especially sprinklers, are available, mass casualties are impossible. The fire not only claimed the lives of the 15 who perished early that morning, but also indirectly those of Stuart and Bolton, the latter dying in 1987 aged 51. Bolton experienced much anguish over the Whiskey fire, but whether or not he turned up on the night of 7 March 1973 was irrelevant. It made no difference to the outcome—it would still have occurred. Stuart wanted him to visit the Whiskey because he believed that Bolton’s presence constituted a strengthened alibi. He was wrong. Despite the ridiculous articles Bolton published in the build-up to the tragedy, he genuinely believed that something may happen, and gave it his best shot in attempting to warn the authorities. For that, he should be commended. The problem was that he had burnt too many bridges, and the evidence was not there. His only source, Stuart, had no credibility, so he was ignored. In the end, his alcoholism and depression, at least partly caused by his foreknowledge of actions that he believed could have prevented the fire, led to his suicide. He was mistaken in his influence; he had served his purpose, most probably for Stuart alone, as he believed that Bolton was assisting his alibi. The fire was locked in, whether Bolton turned up or not. Stuart and Bolton used each other well before the Whiskey tragedy unfolded, and they danced a co-dependant tango until their separate deaths. The police received a torrent of abuse from 8 March 1973 onwards stating that through their inaction, they were responsible. Yes, both the state and federal forces had received prior notification. Hicks spent dozens of hours with Stuart trying to validate the threat, but Stuart told him nothing, as he succinctly stated on 10 March: ‘I haven’t told you anything have I?’ Here was a mentally ill criminal who continually lied to him with a nonsense story about trying to stand over a club that was on the verge of bankruptcy. The police read the unbelievable stories that Bolton wrote, as told by Stuart, these by a reporter who had offered to have Stuart knocked off. There was no corroborating evidence, before and after the conflagration, for Stuart’s sophistry. They are free from blame for the horrible fire; blameless before the fire, but culpable for later events if it is eventually found that there was manipulation. For the firemen, medical staff and club staff who had witnessed the heinous scenes in the Whiskey, their only counselling came from a chat around the mess-room table. Helen herself was 14 when her brother was burned to death. She described Leslie as her hero, as he had literally saved her life: ‘He saved me once when I was drowning. All I can remember is this arm coming down in the water and he dragged me out of the water.’ The psychological scarring was exasperated by her birthday falling on March 9, the day after the inferno. Her ‘beautiful big brother’ never saw his sons grow up and become the confident adults they now are. Indeed, he never met his second son, Craig, who was born in August 1973. Partly inspired by his father’s career choice, Craig followed Leslie into the Army, serving with peacekeepers in Cambodia and Rwanda. He now works as a policeman in remote Queensland. At Colin Folster’s funeral, the family remembered mum’s favourite; the apprentice printer and talented musician who had learnt the piano at school and then moved on to the drums. They recalled his first band, Flipside, formed with a couple of mates and a couple of go-go girls who tagged along with the group. Like his mum Dorothy, he loved to sing, especially Que Sera, Sera, so much that some people called him ‘Happy’. After the funeral, the family retreated to sister Carol’s house. Parents Dorothy and Marx disappeared into a bedroom and did not reappear. They ‘never ever got over it’. Colin’s drums were donated to a church. There are stories like these for each of the 15 families who lost their loved ones, with parents, sons, daughters, brothers, sisters and others all being impacted. There are stories like these for each of the 15 families who lost their loved ones, with parents, sons, daughters, brothers, sisters and others all being impacted. One author describes the Whiskey as the ‘horrific epicentre of all the crime and filth, the corruption and deaths that came before and followed that tragic night in March 1973, when 15 innocent people lost their lives’ to which many still seek the answers. As early as 18 March 1973, the Sunday Sun demanded a Royal Commission, and soon after, Leslie Palethorpe’s wife Nancy demanded justice for her two sons: ‘I want to be able to tell him (the then unborn Craig) and his older brother—Shane Gordon Palethorpe, aged two—why their father was allowed to die in such a horrible way. And the only way I can find out is through an open inquiry. I am bitter because it is quite obvious from the evidence that he died needlessly.’ More than four decades later, the calls remain relevant. The smoke shrouding the truth behind the Whiskey Au Go Go massacre has never lifted. It smells like a cold case, rather than a closed case. The masterminds have never been called to account. Yet there remains time to unmask them. There are enough survivors still alive to warrant an inquiry, enough time to finally excise the primary tumour from which the cancer spread and metastasized beyond Fortitude Valley; if more years pass, the chance will be lost forever. As this book goes to press, the Coroner has been asked by the Queensland Attorney General to reopen the inquest. Like this author, the Attorney General must feel that there is more to the Whiskey Au Go Go story.